Bahrain World Trade Center is a 787-ft, 50-story twin tower complex built in 2008 and the first project of its kind in the world to integrate wind turbines into its design. 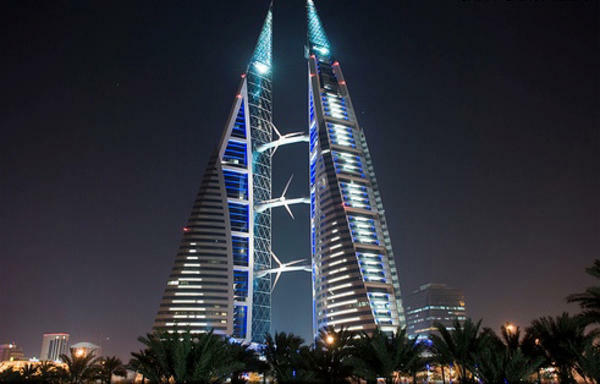 It currently ranks as the second-tallest building in Bahrain, after the twin towers of the Bahrain Financial Harbor. The project has received several awards for sustainability, including the 2006 LEAF Award for Best Use of Technology within a Large Scheme and the Arab Construction World for Sustainable Design Award. During the building’s construction, the original supplier selected for the projects fire rated door and frame material was unable to produce the necessary documentation to prove its end product would meet the required 90- and 120-minute British Standard certification. At the time, Warm Springs Composite Products just happened to be in the office of their UK agent, who was contacted desperately for a possible replacement product and was able to negotiate a last-minute deal to provide banded door core and frame materials that are pre-certified to British standards. In addition, Warm Springs Composite Products guaranteed initial delivery of materials from the U.S. to the Bahrain manufacturer would begin in the short 2-3 week timeframe needed for building construction to remain on schedule. Warm Springs Composite Products worked overtime to produce and start delivering the necessary British certified materials within just a couple of weeks. They had negotiated a deal with their local freight forwarder to airfreight more than 10 total, 40-foot containers that kept the project on schedule and avoided the expensive penalties and damaged customer relationships that would result from missing contractual deadlines. Warm Springs Composite Products even traveled to the production facility as the materials began to arrive in order to help ensure that British standards would also be met as the end products were being manufactured.